Eugene Police is sorry to report the death of K9 Blek, who was hit and killed by an unknown motorist on November 10, while off-duty with Officer Rob Griesel in rural Lane County. K9 Blek was only weeks away from retirement. Just this year, Blek was honored with EPD’s and Oregon Peace Officers Association’s K9 Valor Awards, for the capture of a suspect in the shooting of a deputy. Blek was a German Shepherd from Slovakia. He was born in September 2009 and was selected as a K9 for the Eugene Police Department in March of 2012. Blek served our community with honor and distinction and had a reputation as a K9 who could be counted on in the most dangerous incidents. Blek was a part of our department and will be greatly missed. Our condolences extend to Officer Rob Griesel and his family. The Eugene Police Department has three officers and a sergeant who work with canine partners. These K-9s are generalist or "tracking" dogs. The dogs are used to locate suspects who have run from the scene of a crime, find suspects hiding inside buildings, and search spaces that would be dangerous for a human officer to enter. With their keen senses, these highly trained dogs can swiftly locate hiding suspects and be effective in dark conditions. They can operate where human officers cannot or where officers’ personal safety would be at substantial risk. regularly called out during daytime incidents when needed. 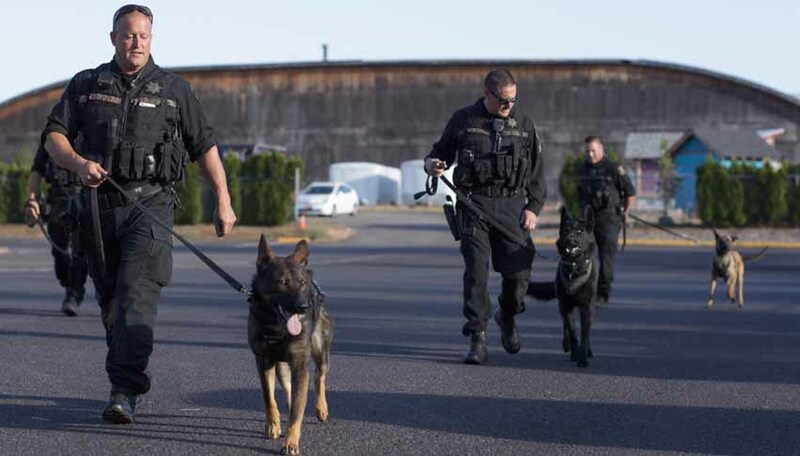 These special teams are also an inter-agency resource, with K-9 teams able to be temporarily “loaned” between Eugene, Springfield, Lane County and other local law enforcement agencies. When a K-9 is needed for a high-priority incident and none is on-duty in that department, one may be dispatched from a neighboring agency. A great hit with both children and adults, the K-9s regularly appear at community relations and crime prevention events to give demonstrations and interact with community members. September of 2008 and was selected as a K-9 for the Eugene Police Department in August of 2012. He is trained in tracking, area and building searches, protection and article searches. X lives and works with his partner, Sergeant Terry Martin, who has been with the Eugene Police Department since June of 1995. Officer Griesel has been working with his newly-assigned K9 partner, Cwyk (pronounced ‘Quick’), who is a two-year-old German Shepherd Dog. The pair started a 4-week training program November 13, with a tentative certification date of December 13.